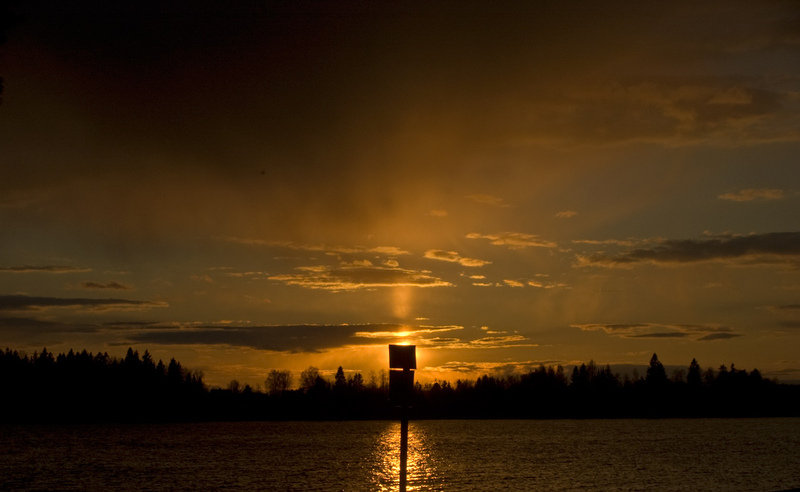 Altocumulus virga usually makes pillars. 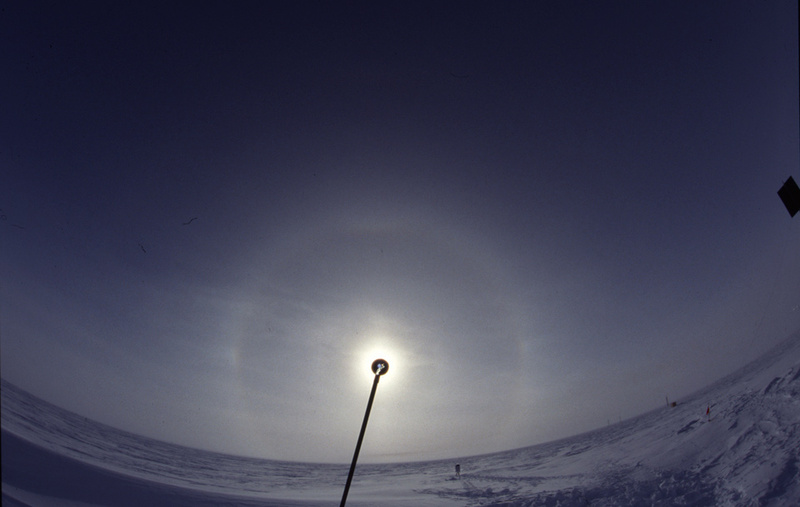 On rare occasions other halos are also seen in it. 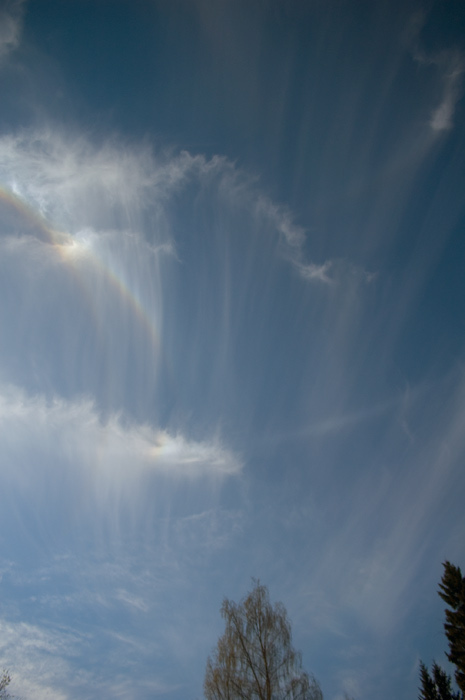 Yesterday Ac turned into virga for several hours and in the beginning unconventional halos were seen in it: upper tangent arc, circumzenith arc and also short patch of 46° supralateral arc. 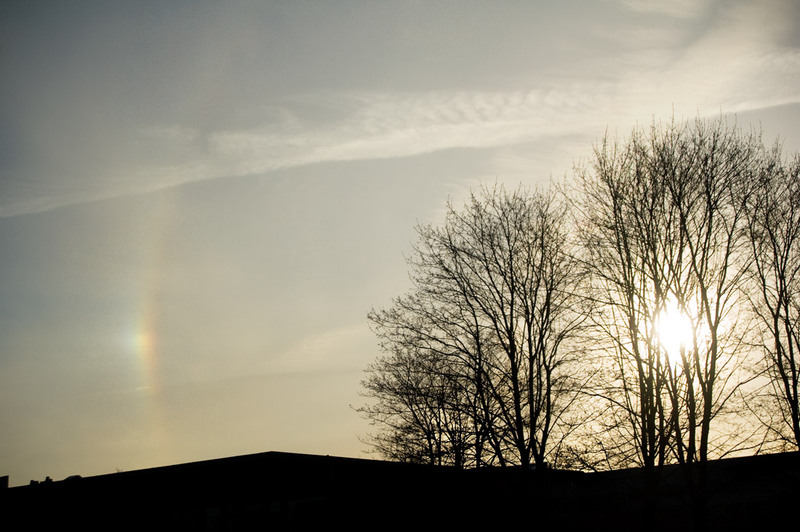 Parhelion occurred on one shot occasion in contrail. 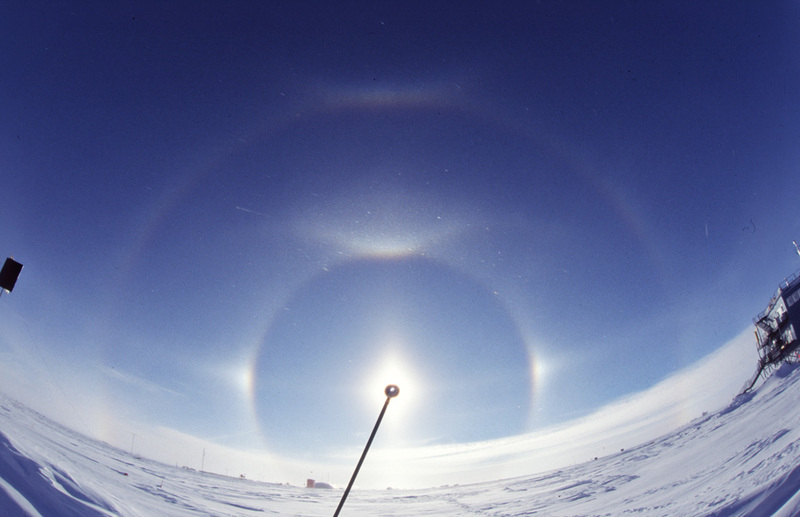 It is getting to look like parhelia in contrail are not that rare after all. Anyways, this is it. For one month I tried to see every halo possible. I am not going to continue photographing all displays, will just mark up the halos. Next it is time to see what kind of statistics I got for this one month. I actually saw cza only on 5 days, but missed pretty certainly one when I was inside. 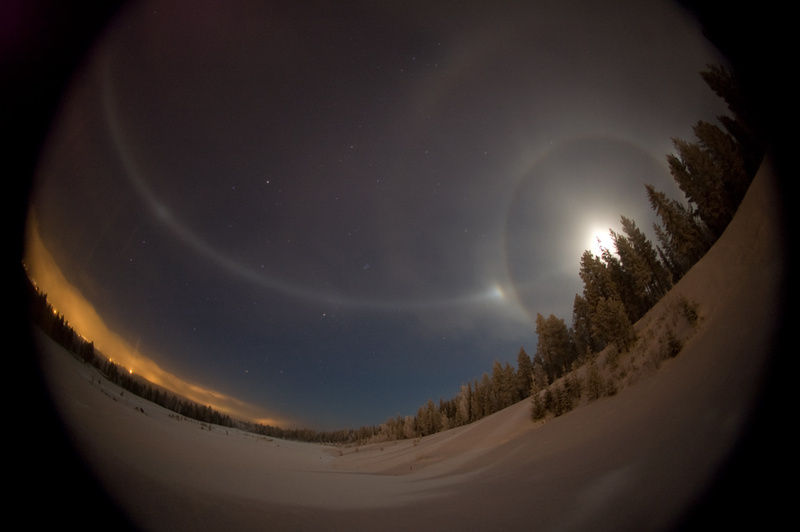 Jari observed that one and I also saw parhelia in that cloud when it had already passed overhead. The numbers above are meant to be absolute numbers of halos, so I added that cza because I most certainly would have seen it had I been outside half and hour earlier or so. Sofar the halo statistics people have made mostly reflect what they happen to see when they look up. Here I tried to see every halo during the day. I woke up in the morning to see the sunrise and stayed up untill sunset on most days. 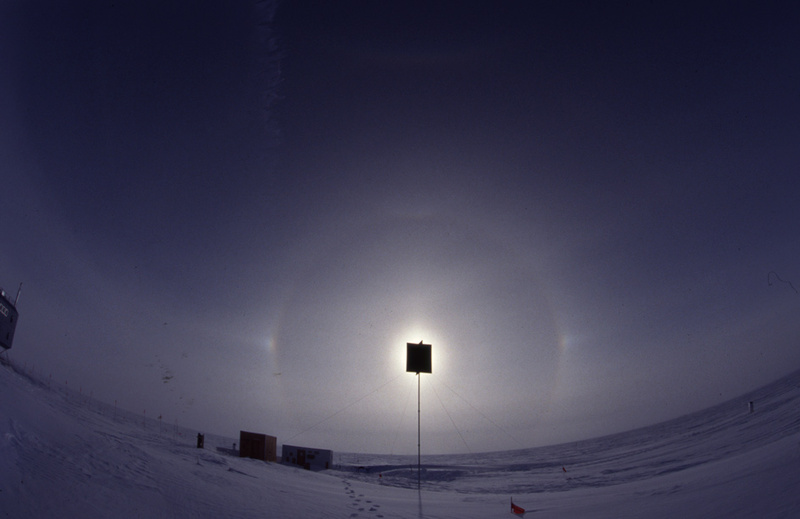 It became evident that pillars and also parhelia are often seen in very low sun situations in the high cloud bank at the horizon. 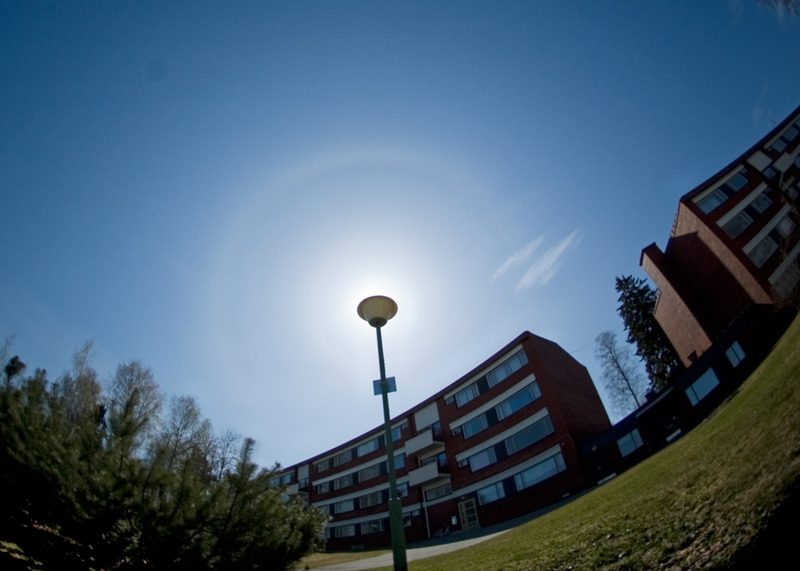 It may very well be that 22° halo is not the most common halo in Finland, but rather pillar is. 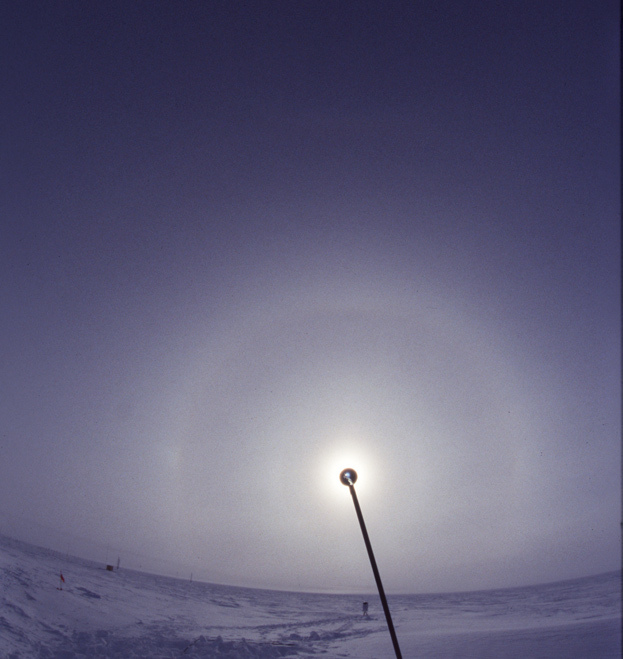 22° halo should have stronger position in the summer when sun spents plenty of time at high elevation when pillar can not be seen, but pillar should gain the upper hand towards the winter when sun is low and when also low level crystals make just pillars. 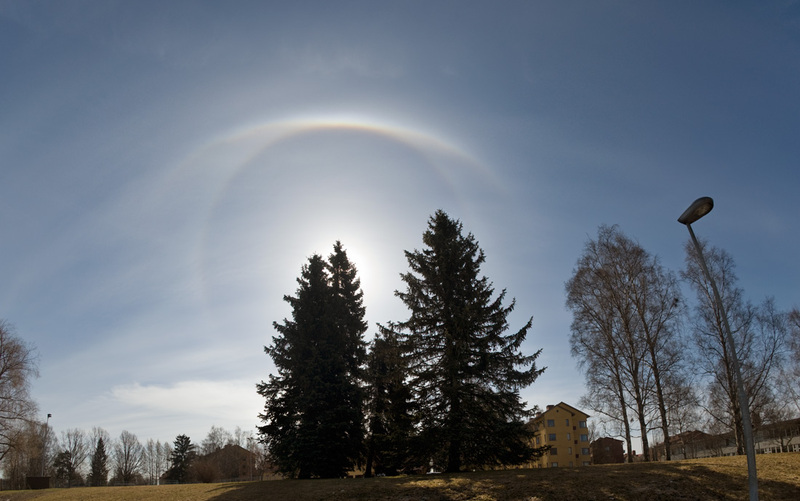 So, as even in the summer month of May the pillar was equal to 22° halo, I would expect in the year’s run the pillar be the most numerous halo. 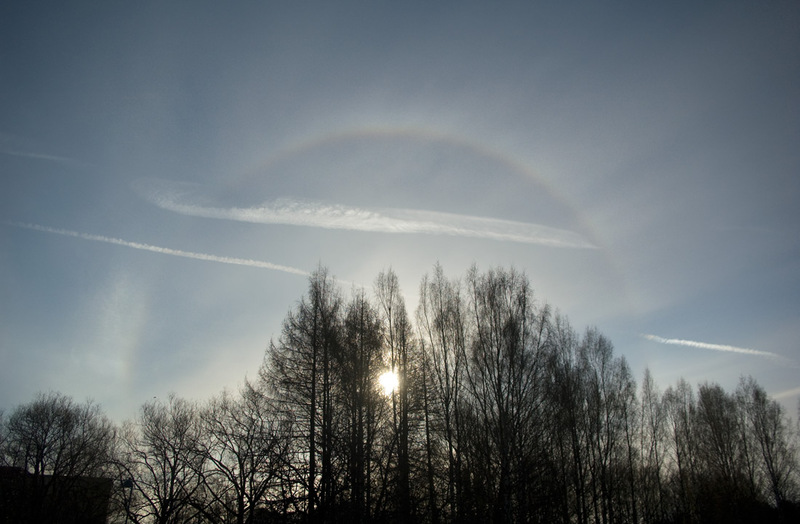 In the morning in Tampere about a minute lasting upper tangent arc and in the evening in Artjärvi a parhelion. 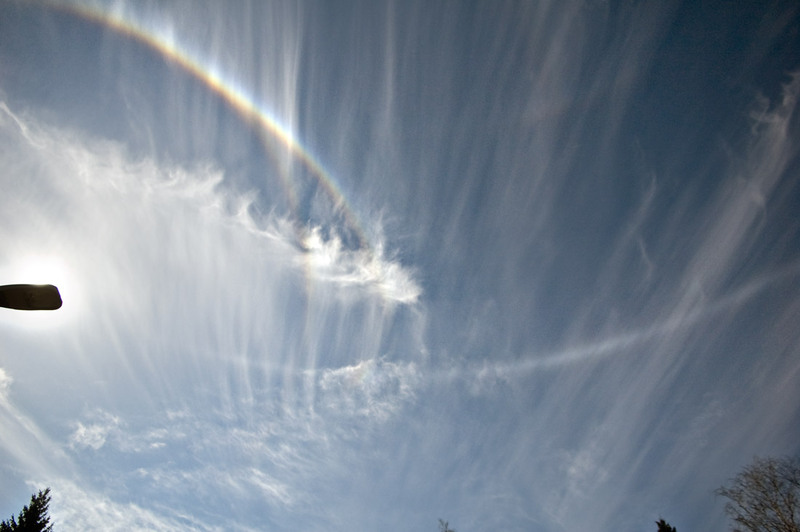 Also upper tangent arc again, but did not photograph that appearance. 21 days of halos in a row. After this two days without halos commenced. 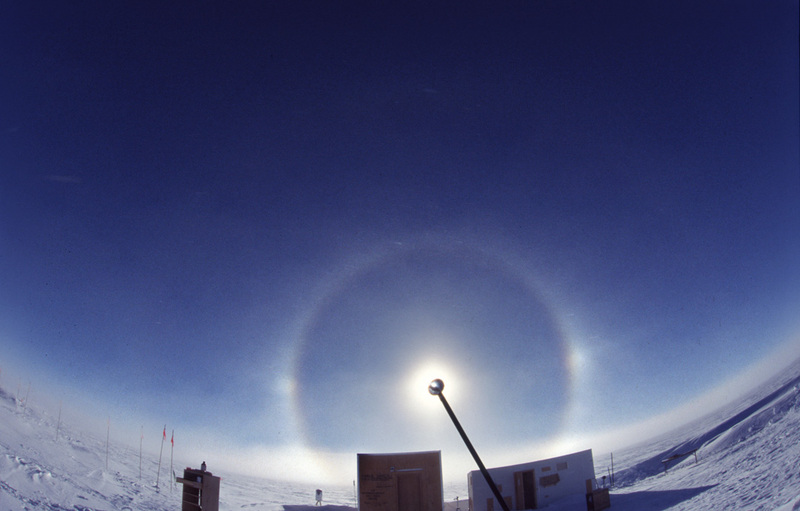 It would have been nice to say about this display: “I was pretty sure this Ac-virga will make an elliptical halo once they reach the sun and that’s what indeed happened”. But that did not happen. Only pillar. 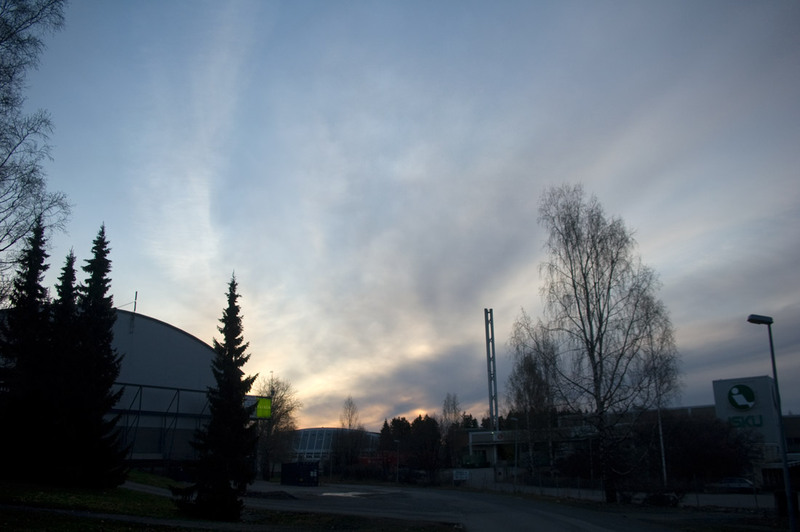 In Valkealampi, Kontiolahti. In the afternoon the clouds came. 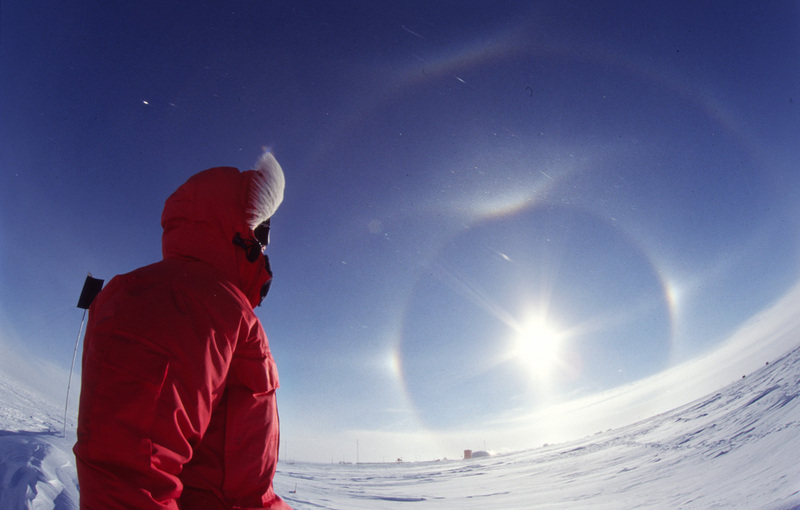 Parhelion was blindingly bright. I followed as the same cloud reached the 120° parhelion position and there was an intensity increase which soon attenuated. 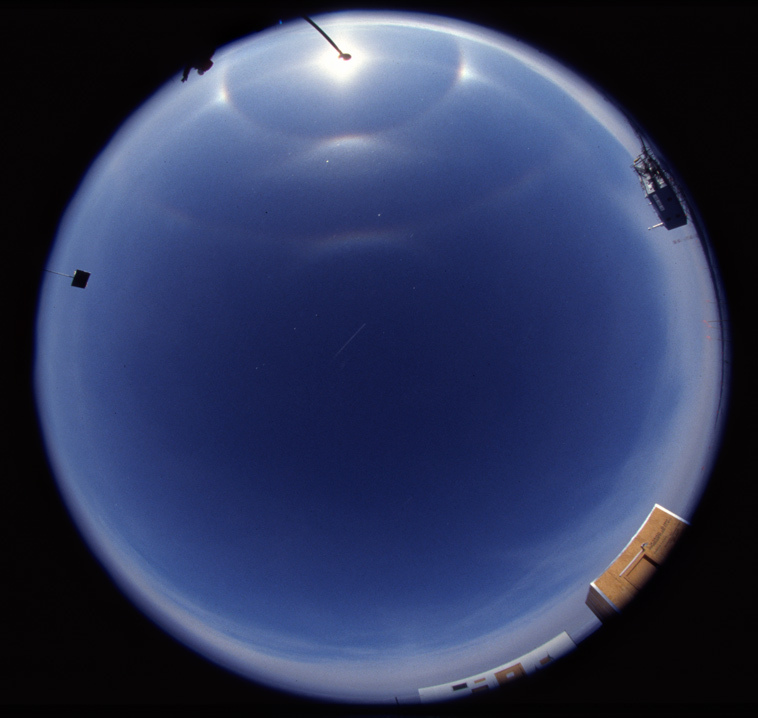 The last image shows two photos taken 88 seconds apart, the 120° parhelion is seen in the left photo, in the right photo the cloud has already moved further and the distant parhelion is no more seen. 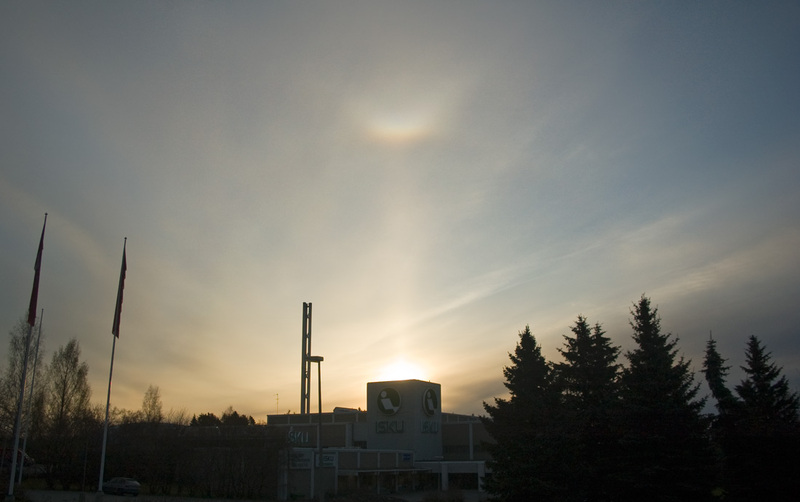 I think the best part of the cloud did not pass the 120° parhelion location, or it would have been brighter. 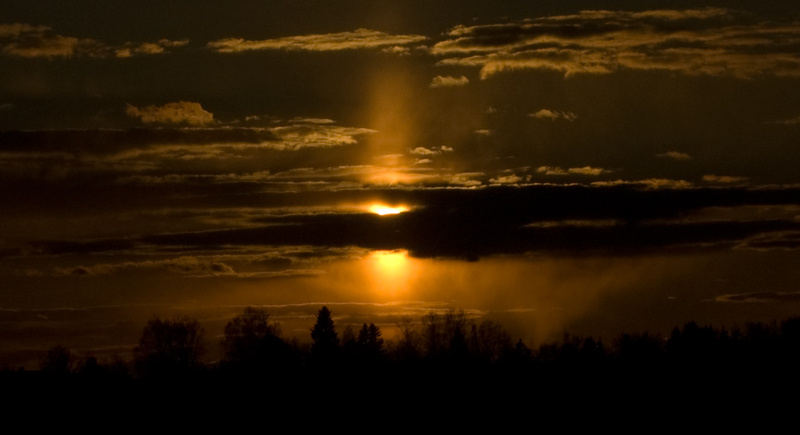 In the spring, when there is a break of cold air from north and snow showers develop in the daytime, it is good chances for sun pillar in the evening. 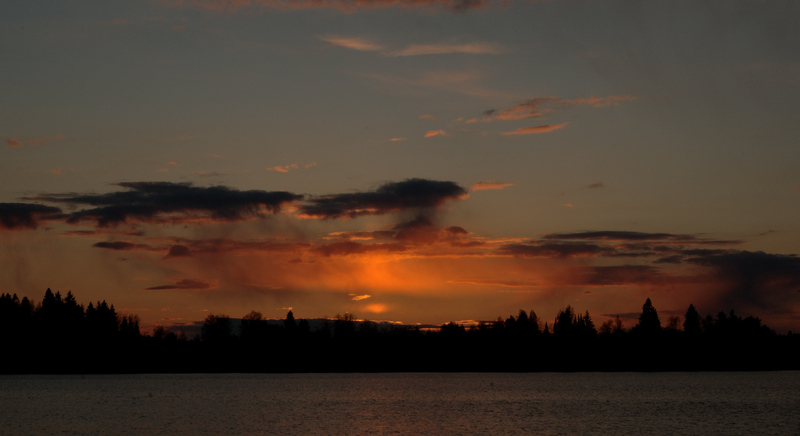 This is because the snowing cumulonimbus start losing their power and reduce to stratocumulus with icy virga. 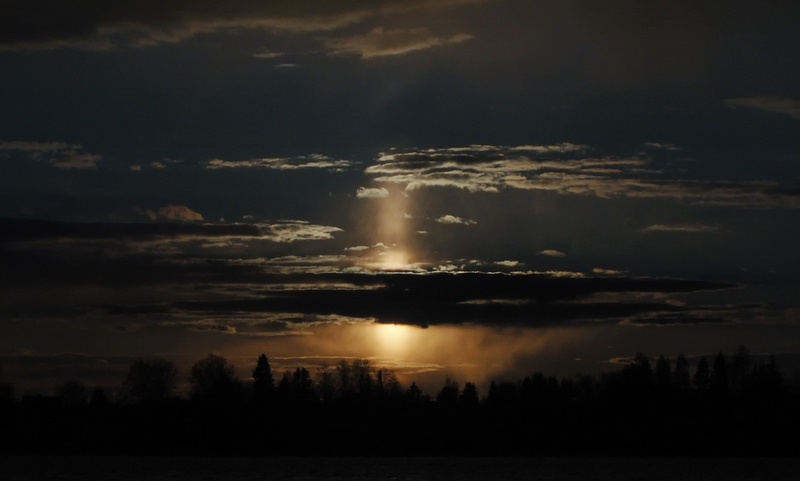 And the virga of low and middle level clouds often consists of crystals that make decent pillars. This is what happened on 1. May in Tampere. Above are some photos from the evening. There was also an attempt of fake sun, but for my criteria it was not quite there yet. These low sun pillars and fake suns are difficult to photograph because of the clipping of red. The fifth image (small thumbnail on the right) is a series of the fake sun attempt: the pillar below the sun in the beginning of the series was blindingly bright, even though I was watching with sun glasses (you need welding glass to observe these properly). 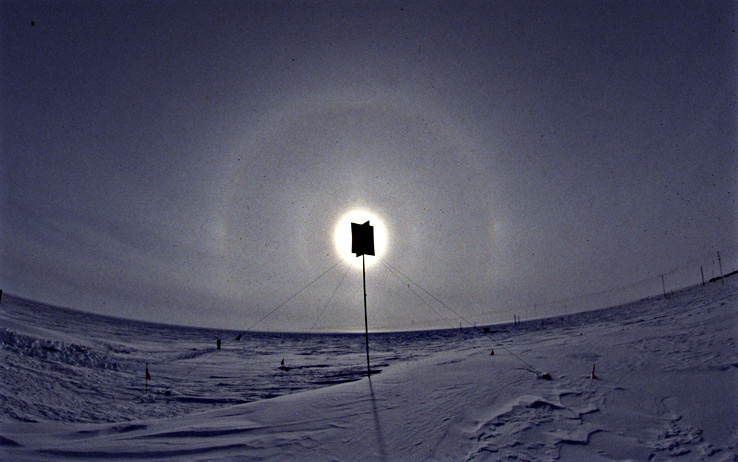 In the end of the series the true sun is coming visible. The photos were given lowest white balance value possible and highest recovery value in Photoshop. That’s how red clipping was gotten rid of. The downside for this realism is unrealistical blue photos. The leftside photo in the gallery on the second row is the same as the first in the blue series, but with more normal white balance values. There is red clipping that masks the true nature of the pillar / fake sun effect. Now here is an example of a display where you see nothing special visually. 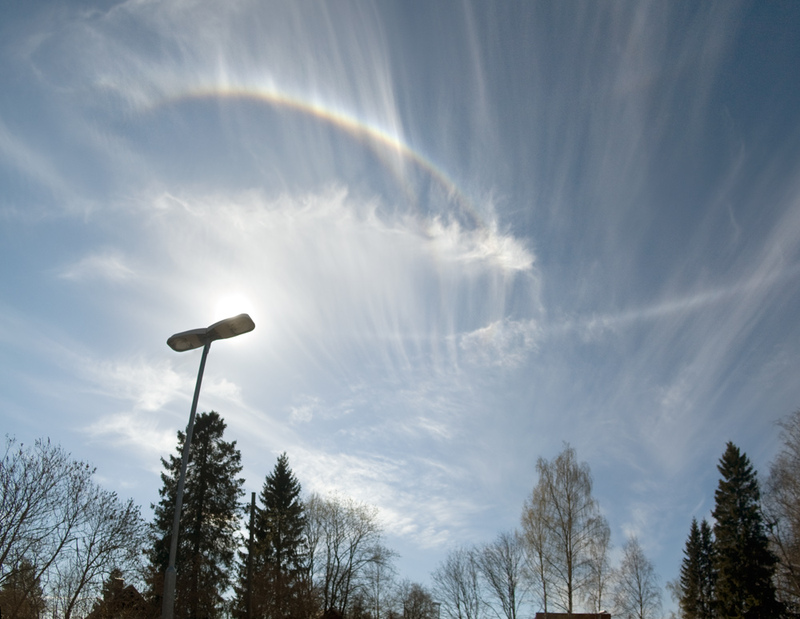 Just a faint 22° halo that is a bit brighter from the top. But there was one visual clue, however, that revealed it might be an odd radius display. 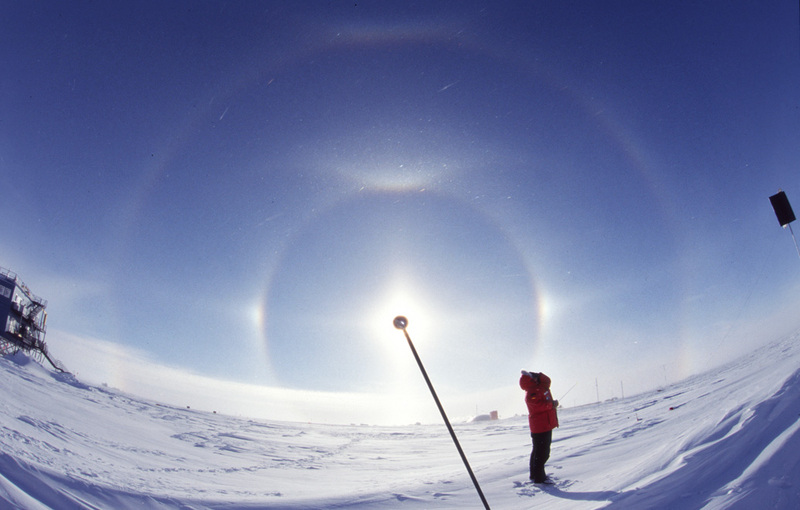 It was the broadness of the 22° halo. 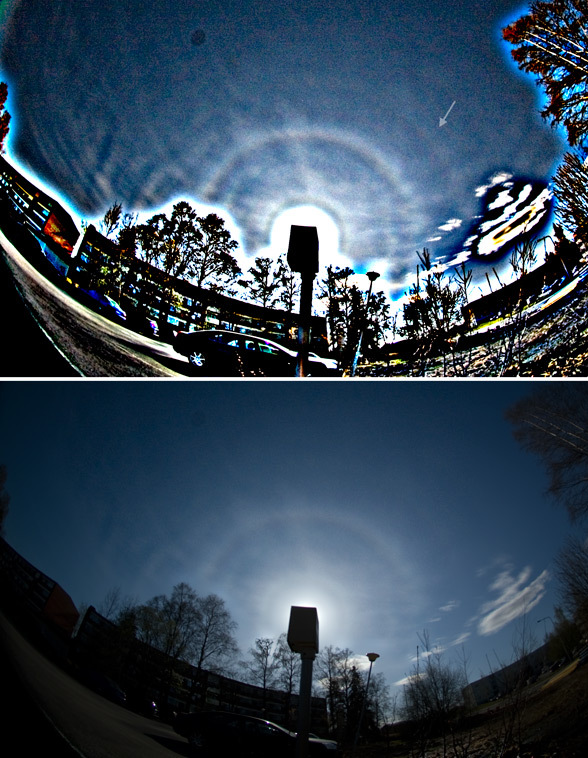 And indeed, in the photos 9° halo is seen as well as 18/20° halo. 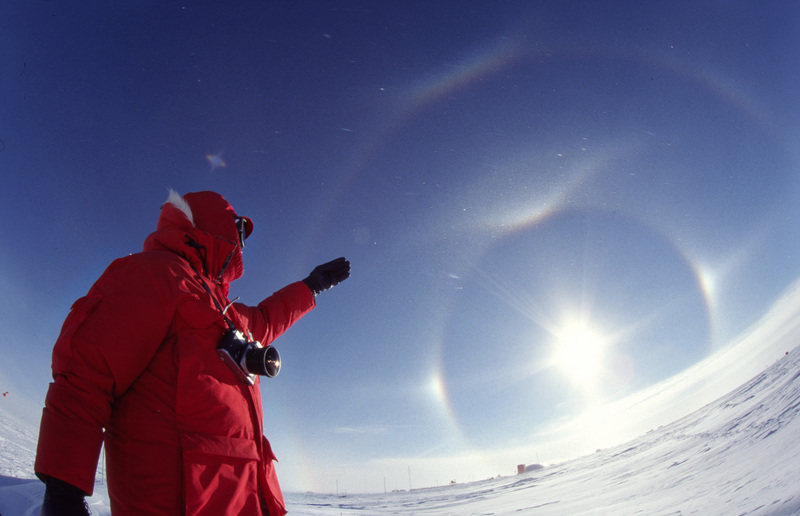 The outer halo might not contain 22° halo at all, rather, it can be 23/24° halo. 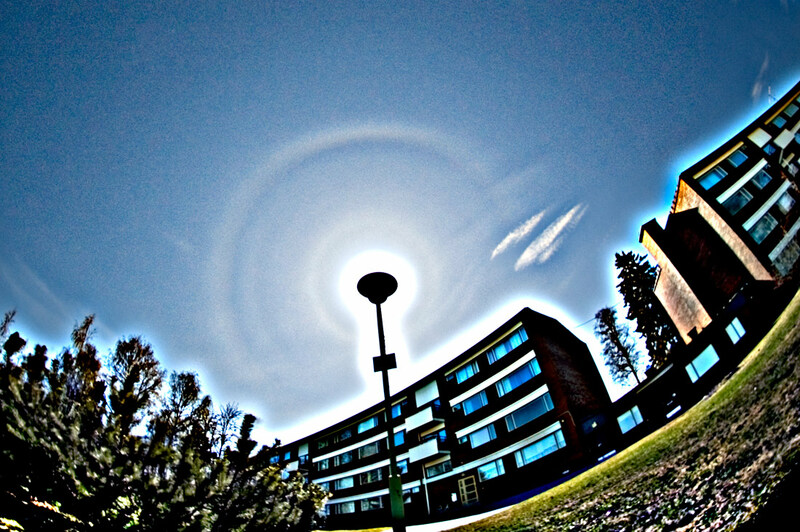 Had I had a convex mirror, the 9° halo would certainly have showed up with it, also the 18/20° halo. The two photos above are versions of one. They are 2 minutes stacks. The date is 28 April 2011. The display just continued and one could have gotten several hours stack of it. 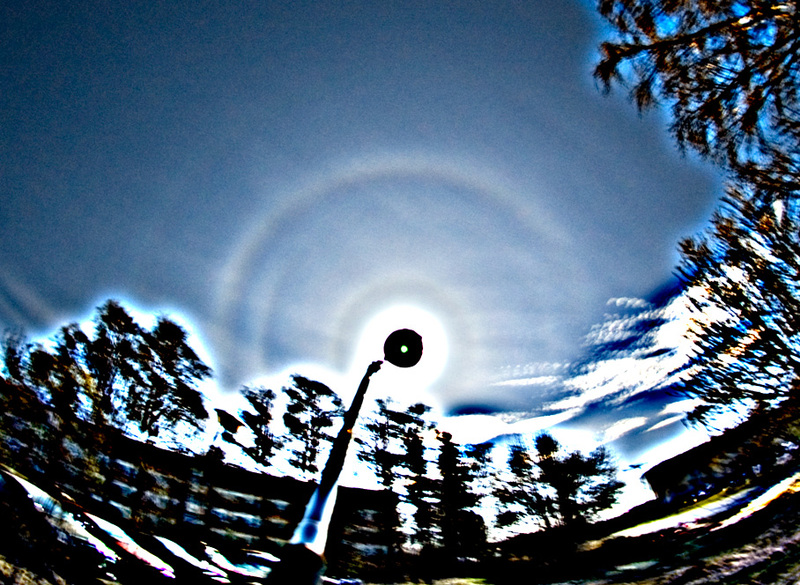 When in the afternoon 9° halo was visible to the naked eye, I took another stack in the middle of tyre changing. 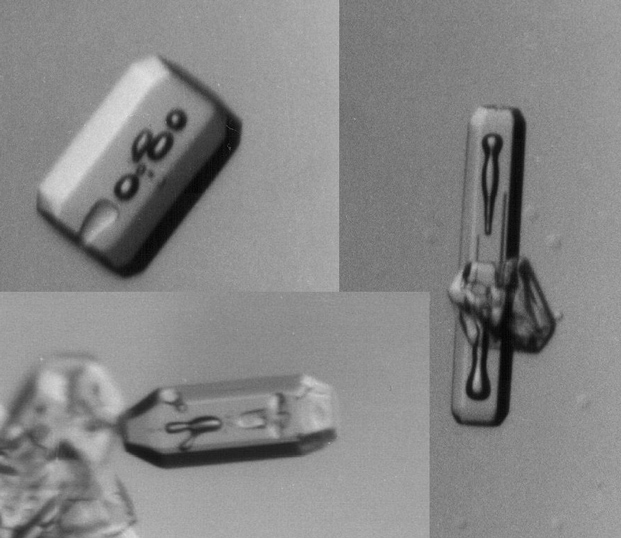 The third image has 7 frames taken during about 2 minutes. 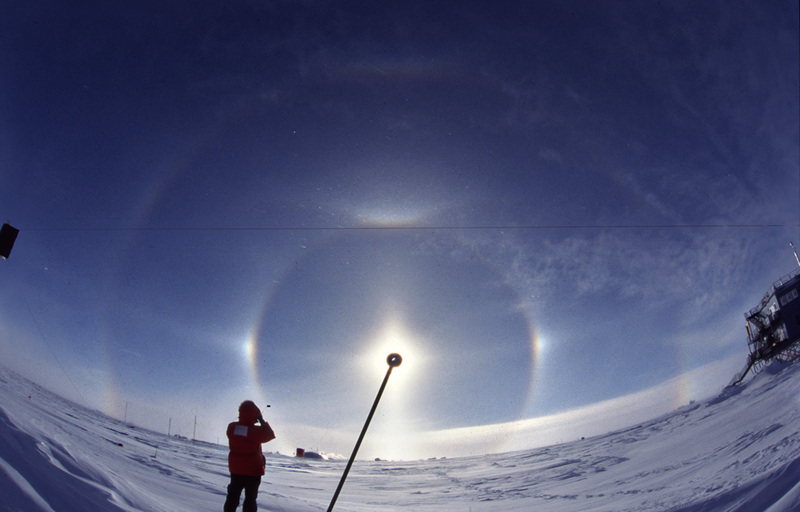 There is 35° halo (arrow), it is seen also in single images, which means it would have been observable with convex mirror. Fourth image is a bit longer stack. 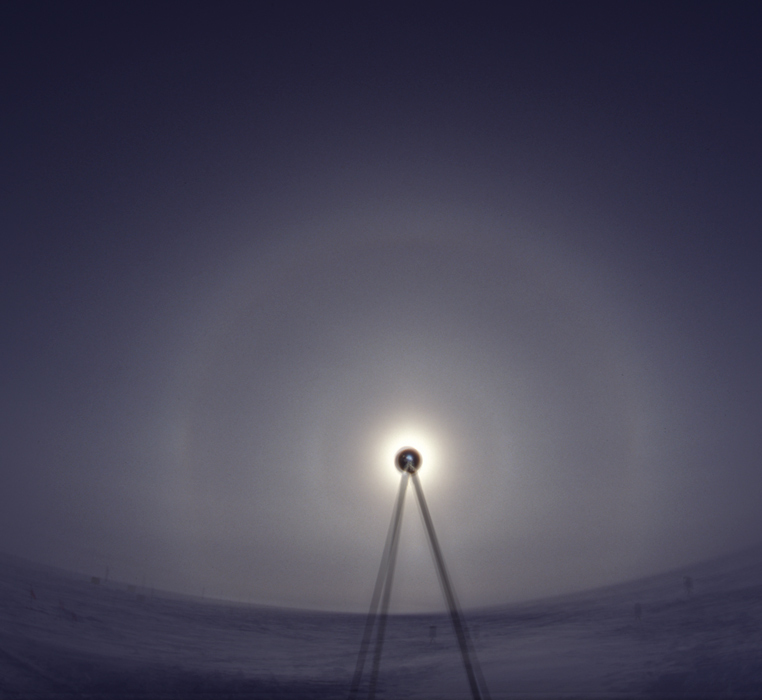 Now the 35° halo is on the other side. Not seeing a colored Wegener when it is there can hollow a halo man up. Just that’s what happened today. There was a nice little display little in cirrus and I found Wegener from the photos afterwards. It is actually rather typical for me to not see them. Curious incidence was that I took a panorama of the same clouds earlier when they were closer to horison and not yet at halo making distance. I did not expect them to show anything special. Hugin is good now for halo panoramas as it gives 16 bit output. 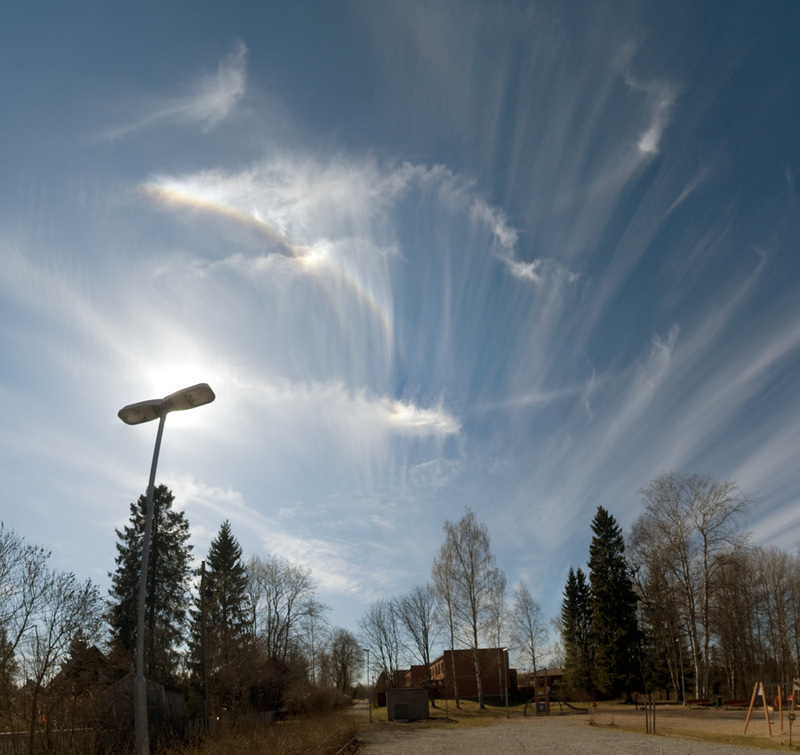 I put here also two different projections of the cirrus cloud panorama. The first is cylindrical and sencond is rectililnear. The rectilinear represents the clouds more like they appeared to the eye, being straight stripes. 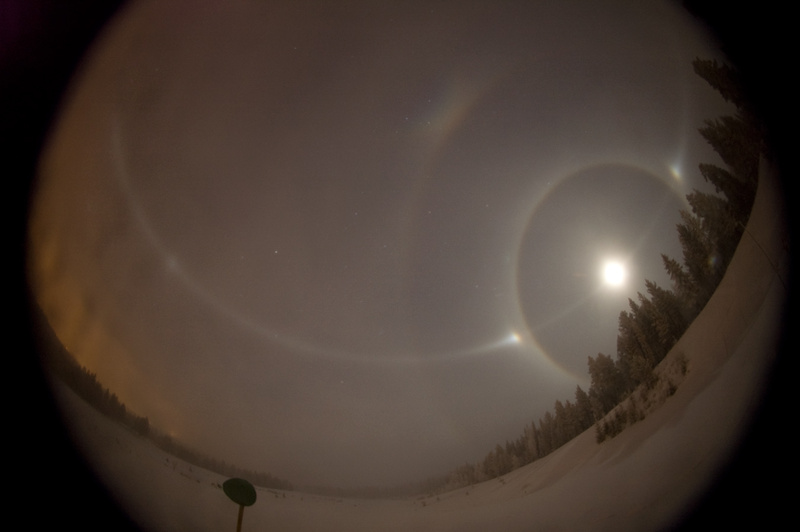 Before the moon halos appeared, diamond dust was so thick that moon did not shine through and I photographed in spotlight beam. 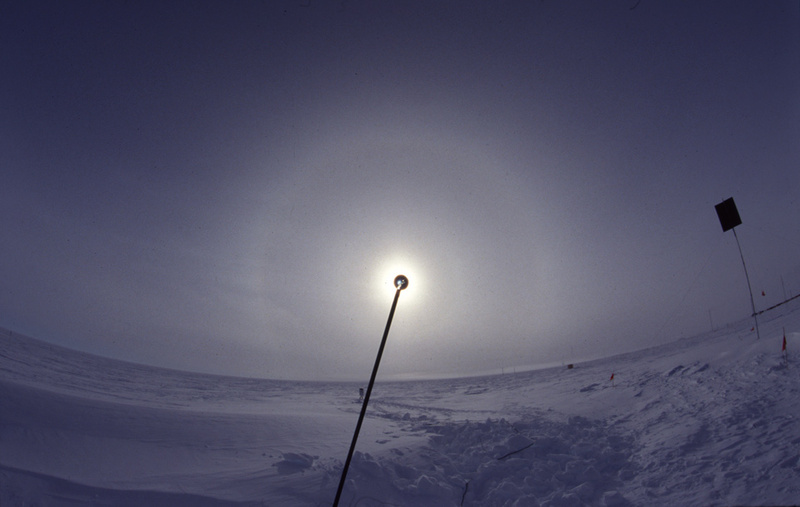 As the the diamond dust started thinning, it also lifted up from the ground – there were not much crystals on the ground. 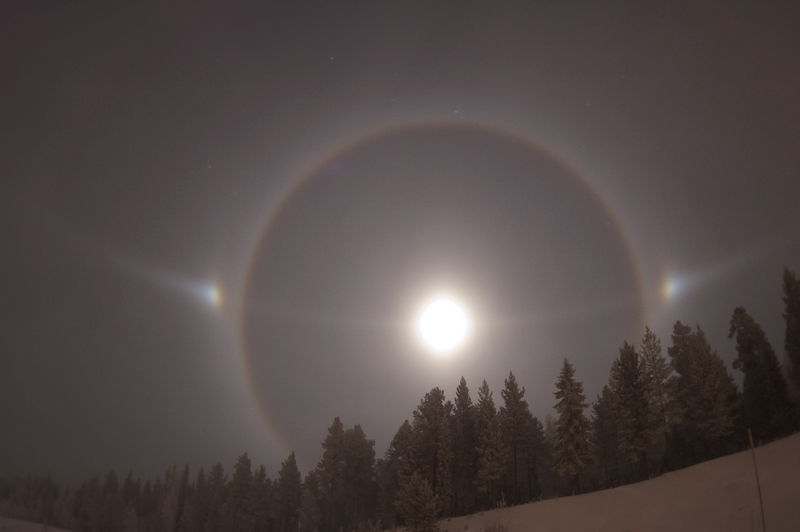 The moon elevation is about 30 degrees judging from the circumzenith arc which is slightly separated from the 46 halo. 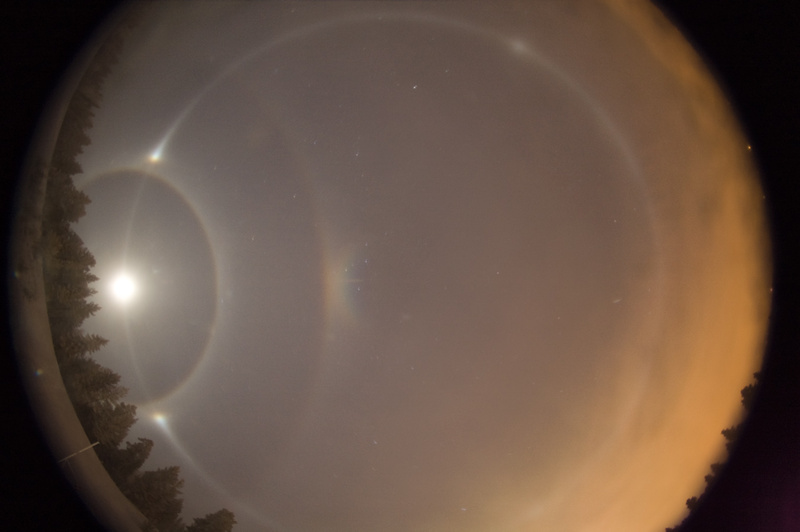 This was a long lasting display with faint odd radius halos. 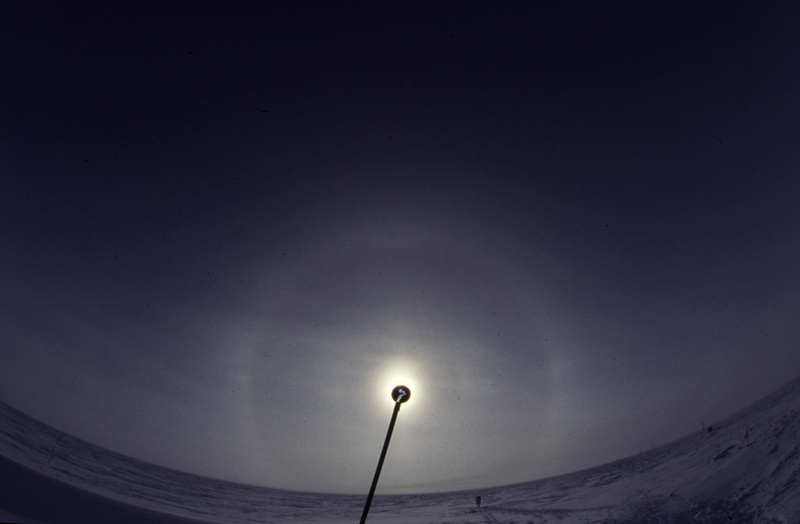 The scanned slides here only show 9° stuff, but there was more, also the 20° and 24° halos. 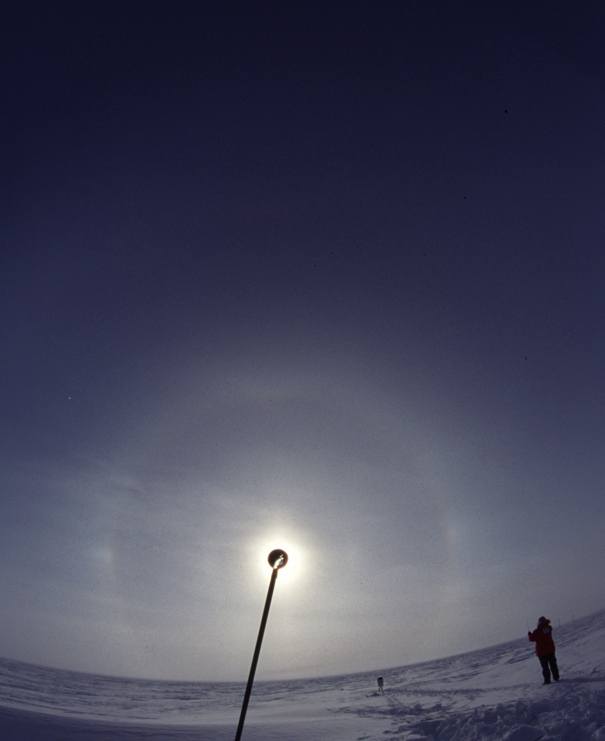 The crystal orientatation is poorly column oriented as the 9° halo is slightly brighter on the sides. 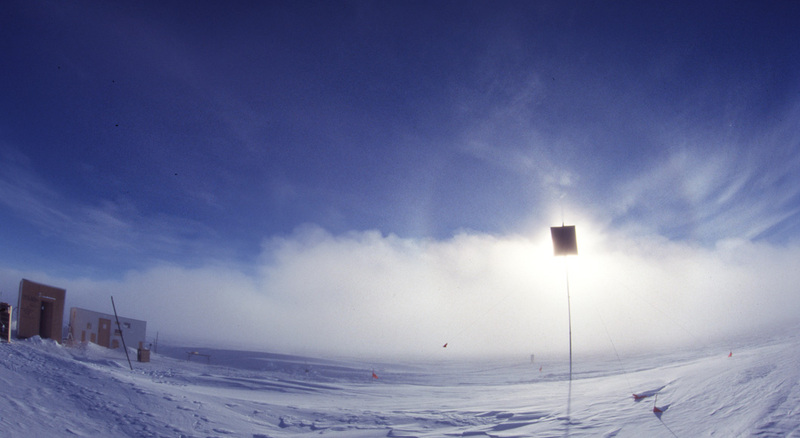 And indeed, in the crystal photos we took with Jarmo Moilanen there were columnar pyramids. 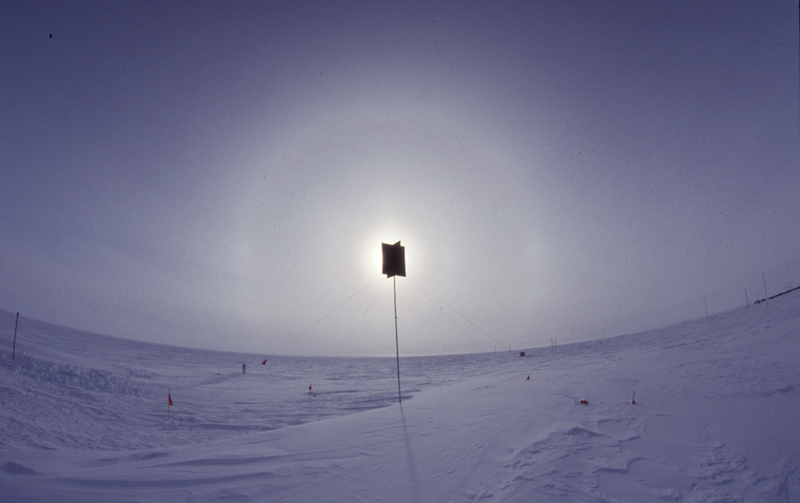 Basic display at South Pole. 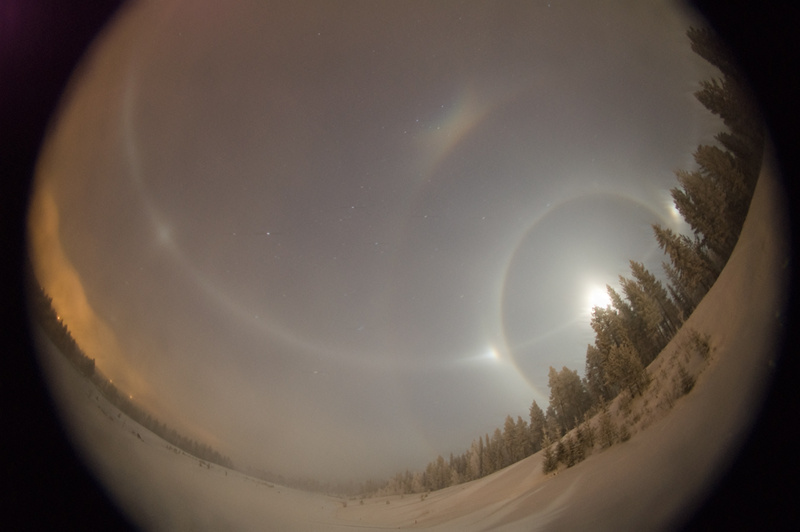 The third image is taken by Jarmo Moilanen. 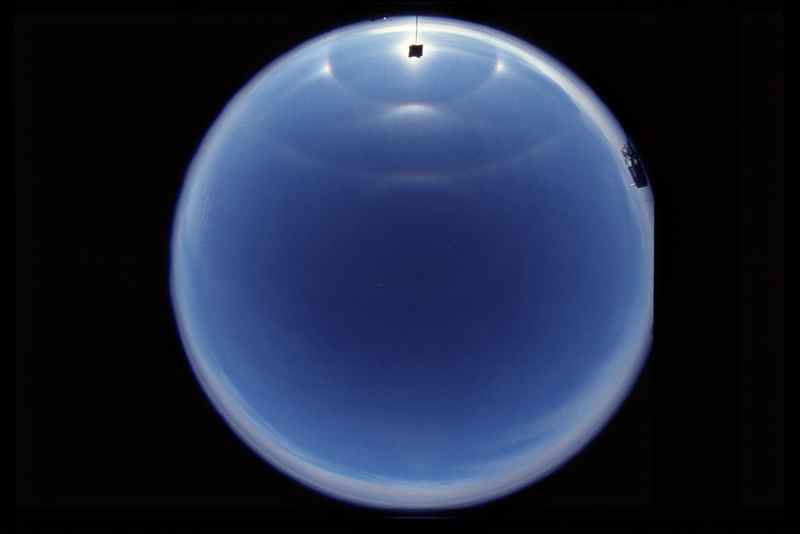 The last two images show a contrail display.